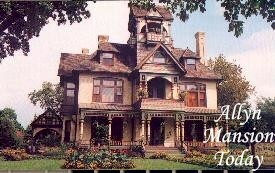 The Allyn Mansion was built in 1885 for the Alexander Allyn family, a wealthy farm family of Delavan. Along with their houses on the various farms in their holdings, the Allyns had three houses (one for themselves, one for servants connected by a gallery, and one for guests) on Lake Delavan, and a winter home in Los Angeles. With the completion of construction of their in-town residence, however, it (the mansion) would become and remain their principal dwelling. Mr. Allyn died on a cold February day in 1913, sitting in one of the East parlors, reading the afternoon mail. (We surmise that he may have just opened his heat bill!) Mrs. Allyn continued their usual lifestyle, winters in Los Angeles with her beloved step-daughter, Esther, and summers in Delavan near her son Joe, who managed the farms, until her death in 1939. Upon her death, Mrs Allyn bequeathed the mansion to Esther who, as she said, was "like a true daughter." For the remainder of her life (until 1948), Esther kept servants in the house but only used it two or three times on the occasion of family reunions. When Esther died, the house went to her daughter Ruth. 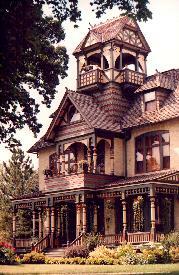 Ruth kept the house two years, during which time, alterations were made on the structure which nearly destroyed the masterpiece created by E. Townsend Mix. The outside needing repair, Ruth got estimates which totaled $5600. Deciding ultimately to alleviate the problem forever, she decided to spend $10,000 and have all the problem areas removed--the tower, balcony, porch and portecochere, i.e., all the wooden parts. 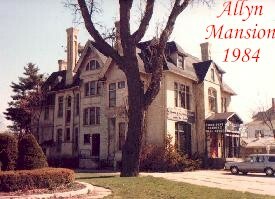 After "fixing" the mansion, Ruth sold it to the city of Delavan to be used as a municipal building. Due to some rethinking of plans, the city opted to do otherwise and sold the building to a nursing home group. The Allyn Mansion's commercial era had begun. The front lawn became a parking lot, a fire escape was added on the east side of the house from Mrs. Allyn's bedroom--now a nursing station, and certain alterations were made on the interior to facilitate better use of the elevator that had been installed by Mrs. Allyn in 1929, and to add restroom space. Because of stricter state laws for nursing homes in 1966, the facility was closed due to the would-be costs for bringing the building into code. It remained closed for three years before becoming a furniture store. The furniture store owners continued the "improvements" on the property with removal of certain walls and addition of cream paint everywhere, covering original wallpapers, stenciled walls and frescoed ceilings. The furniture store closed in the spring of 1983 and the property languished on the market until bought by Joe Johnson and Ron Markwell in November of 1984. With the shell of the mansion containing nothing of the original splendor or furnishings except for the nine original fireplaces, two original mantel mirrors, six wonderful gasoliers, a kitchen work table and the original house plans by E. Townsend Mix, the new owners set about making a silk purse out of a sow's ear. 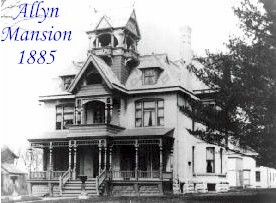 Today, after years of painstaking labor, incredible frustrations, but never a lack of enthusiasm, the Allyn Mansion looks like it "should have" looked in 1885. It's "meticulous and thorough" restoration brought the Allyn Mansion the coveted Grand Prize from the National Trust in its Great American Home Awards in 1992--the highest prize in the country for historic preservation. The following year brought awards from the Wisconsin State Historical Society and the Wisconsin Trust for Historic Preservation. 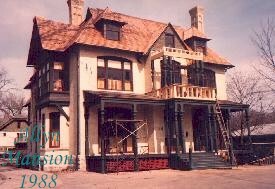 The Allyn Mansion restoration project is considered to be one of the finest private restoration efforts in the country.